How to create an invoice in Method. An Invoice can be created in Method using the Invoices App. 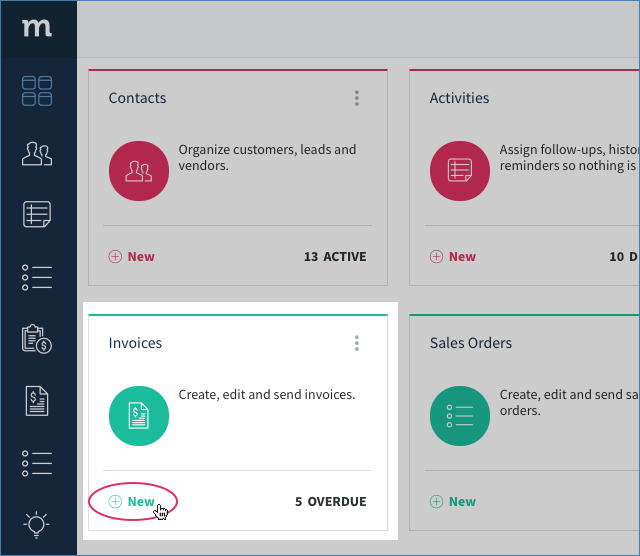 This article will explain the different parts of the Invoices screen. 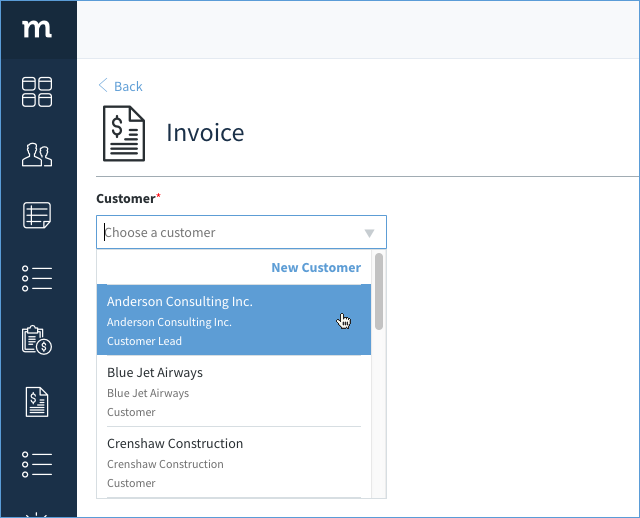 These steps focus on creating a brand-new invoice in Method's Invoice App. In addition, you can also convert a sales order to an invoice, and an estimate to an invoice. Note: Differences exist between how QuickBooks Desktop and QuickBooks Online accounts sync with Method, which means some of the fields appear differently (and sometimes do not appear at all). We note where these discrepancies appear. 1. Click ⊕ New on your Invoices App, or click ⊕ New Invoice from your Invoice List. 2. This opens your New Invoice screen. Choose a customer or lead to associate with this invoice. Once you select a customer, more fields will open up to fill in. At the top will show your customer, the total, and App Ribbons to show associated activities with this invoice. Invoice #: Created if the field is left blank, and is assigned sequentially (if the last invoice was #15, this will be #16). P.O. Number: Include a purchase order number if applicable. QuickBooks Desktop Only. Ship method: Choose how this product will be shipped, if applicable. QuickBooks Desktop Only. Account: Choose the account a payment is applied to. By default, this is Accounts Receivable. QuickBooks Desktop Only. Sales rep: Assign a sales rep. QuickBooks Desktop Only. Assigned To: Assign a Method user to this transaction. QuickBooks Online Only. Terms: Assign terms to this invoice. 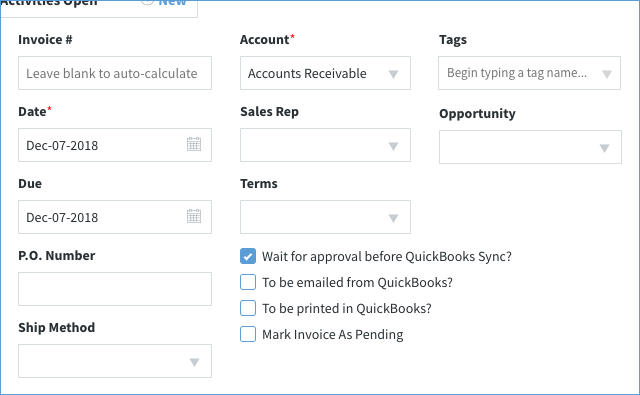 Wait for approval before syncing: Prevents the invoice from syncing to QuickBooks until a user unchecks this option and saves. To be emailed in QuickBooks? : Flags the invoice in QuickBooks as "to be emailed"; group and email multiple invoices in QuickBooks. To be printed in QuickBooks? : Flags the invoice in QuickBooks as "to be printed"; group and print multiple invoices in QuickBooks. Mark invoice as pending: Flags the invoice in QuickBooks as "pending"; do not send this invoice to the customer yet. QuickBooks Desktop Only. Note: A pending invoice does not influence the general ledger (is not yet seen as money owed). Class: Classes are used to sort your transactions. QuickBooks Desktop Only. Opportunity: The opportunity this estimate is linked to. 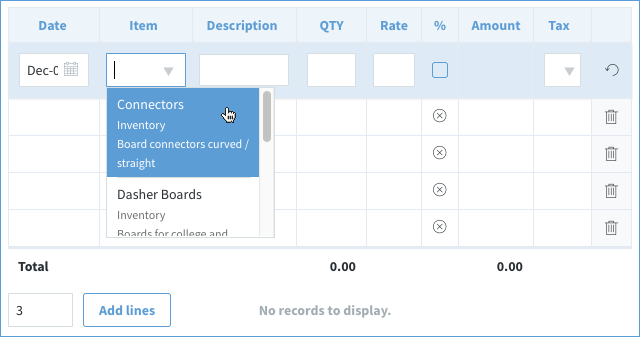 Line items are added to the Invoices using the Line Items grid. Items available are taken from the Items App which is synced with your QuickBooks account. By clicking on a row, each column (other than the Amount) can be edited to fill in details for each line item. To add QuickBooks items to this invoice, add them directly in the grid. To add more lines, select the Add Lines button. Line items are not saved until you save the whole invoice. If you updated the line items and log out of your session, they will not be saved in the invoice. Note: If you are on QuickBooks desktop, this is a dropdown list of messages. Currently, these messages are managed within QuickBooks. Find the Customer Message List within QuickBooks Desktop if you wish to change the messages. When you have finished your invoice, click Save. This will update Balance Due. Delete: Delete the invoice. This cannot be undone! Make a Copy: Create a brand new invoice with the same information and items. 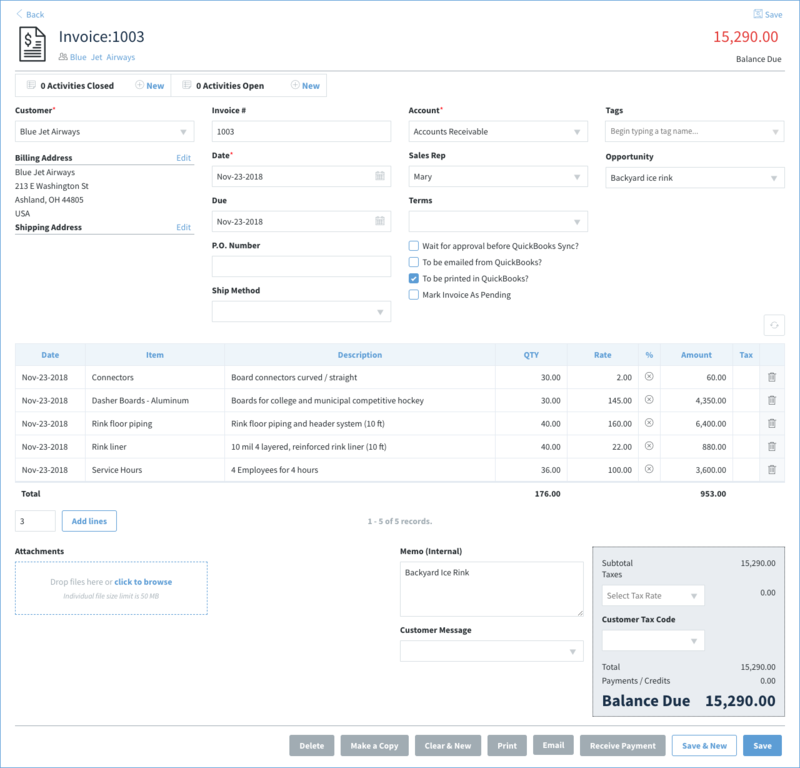 Clear & New: Clear the current invoice to create a new one. Print: Creates a pdf file of the invoice which you can print.Your pop-ups must be enabled for Method, else the document will be blocked and nothing will happen when you click this button. The pdf is created using a template chosen within your app preferences. Email: Email the customer a link to their portal where they will be able to view the invoice online. You will get a preview of the email before sending it out. Receive Payment: This will take you to the payments app with the current invoice selected to be paid. From there, you can process the payment for the invoice. Save & New: Save the invoice and clear the form to enter in a new invoice. If this invoice is being created as part of an ongoing opportunity, please follow these steps. 2. Locate and select the opportunity you wish to link this invoice to. You can search manually or use the search function at the top of the screen. This opens the Edit Opportunity screen. This will take you to the screen to create a new Invoice, and you can follow the steps above, beginning with step 3. Your invoice is now linked to the opportunity, which means it appears in the Invoices app ribbon for this opportunity.